Just before His crucifixion, Jesus was confronted with a tantalizing question that Satan continues to use even today, "What is truth?" (John 18:38 - NKJV) You see, if the devil can convince us that truth is uncertain, if he can tempt us into believing that truth changes, then he can dull our conscience by showing us ways to justify our sin. Everyone wants to do things their way! No one likes having a boss! If truth is not certain, then we get to choose our own definition of truth and, of course, we are going to choose all the things that meet our desires. On the face of it, undefinable truth sounds pretty good. Whatever feels good to me, that is truth to me! I am in control! But there are at least two major problems with this line of thinking and, much like a three-year-old who is allowed to eat as much candy as she decides is best, both of these problems lead to a nauseating end. Problem 1: Your definition of truth will not always harmonize with my definition of truth. In fact, our definitions will often conflict and then who gets to decide? Darwin, the father of the theory of evolution, decided that such conflict was decided by a law called "survival of the fittest." Q: Does that approach sound remotely civilized to you? I'm bigger and stronger than you, therefore, I get to punch you in the face every time we disagree and force you into choosing my definition of truth. Some would say, "But that's exactly what your God does. He claims to be bigger and stronger and, therefore, forces us to live by His definition of truth." My answer, "Nonsense!" You are free to live by any definition of truth you choose. Look at the world. The majority of its citizens do not live by God's definition of truth and have done so since the creation. Aww yes, the creation. That brings me to the second reason an undefinable truth is a recipe for chaos and destruction. Problem 2: Your definition of truth will not always harmonize with the One Who gave you life and is, at this very moment, giving you permission to breathe. He is your Father, your Creator, the Protector of all that is you. Your total dependence upon Him gives Him the right and responsibility to define truth for you. He asks that you choose His definition, not out of some animalistic law of the jungle ("Survival of the Fittest"), but out of a logical response to His paternal compassion. I mean, come on! He sent His Son, your brother, to a bloody cross in order to preserve your existence. Don't you think He deserves to write the definition? Back to the question above, "What is truth?" Shortly before Jesus went to the cross, He spent a great deal of time praying for you and me. Yes, can you believe it? He was on his way to die and He actually took time to pray for YOU and me! Notice these words, "I do not pray for these alone (the apostles), but also for those who will believe in Me through their word." (John 17:20 - NKJV) That's us! That's you and me! That was the prayer of our big Brother on His way to rescue us from the claws of Satan. Our God is not a tyrant! He doesn't force His definition on us. He shouts His love through the blood of His Son. He pleads from Heaven, "I made you! I know what is best for you! Please, for your own good, let me be the One Who defines truth!" There are two essential parts to this definition. 1. Truth leads to sanctification (being cleaned and set apart as holy). 2. Truth is the word of God. In other words, in order to live in truth you must live in His word and you must allow His truth to cleanse you (See Ephesians 5:26). Only by living in this way can true order be found in life. Only by living by His definition of truth can peace be found in the midst of Satan's deceptive chaos. Many years ago, in the very ancient past, travelers discovered that the North star never changes its place in the night sky. Unlike other stars, which cannot be trusted, the North star holds its position and remains constant through their entire journey. 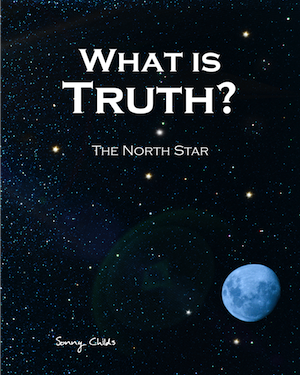 God's definition of truth is our North star. His Word is the unchanging reference point that successfully guides us through our journey. Without Him, a shipwrecked life is inevitable. With Him, we can travel through eternity and never be lost. What is truth? His Word is truth! Go To: Part 2 - "What Is Truth? The Sacred Origins"
Back to Top of "What Is Truth? The North Star"